On the latest episode of The Walking Dead, survivors from the Kingdom went on a supply run while Hilltop were faced with a demand from The Whisperers. 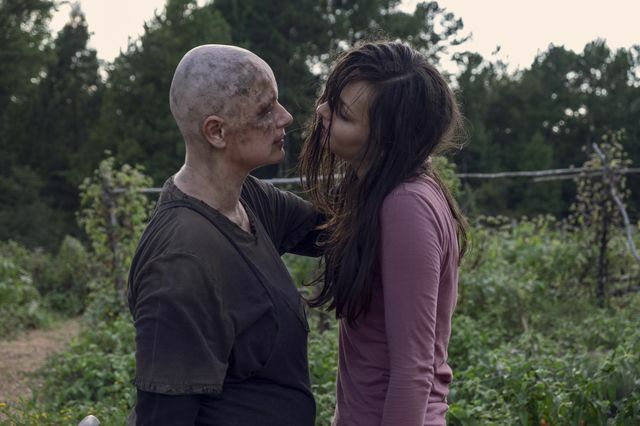 At the end of last episode, Alpha (Samantha Morton) turned up at Hilltop with a bunch of Whisperers and demanded the return of her daughter Lydia (Cassady McClincy). Instead of showing what happened next, the episode started off with a flashback. 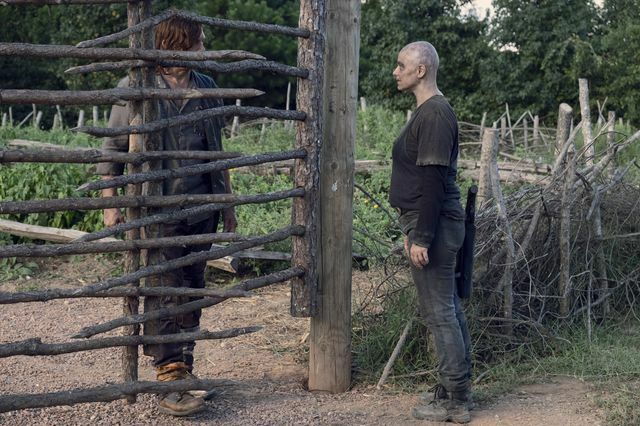 It was confusing at first to see Jesus (Tom Payne) alive and Carol (Melissa McBride) with shorter hair than we’ve seen in recent episodes. It soon became apparent that this was a flashback. This was a meeting also with Tara (Alanna Masterson), Ezekiel (Khary Payton) and Jerry (Cooper Andrews) before Maggie left. Tara brought medicine from Alexandria and had decided not to return. She also gave Ezekiel the community charter which he later hoped to get signed by all the communities at the fair. Back in the present, Ezekiel and others from The Kingdom were heading out on a mission that was weeks in the planning. They were off to hunt elk to feed everyone but first had a side quest which involved stopping off at a cinema. The aim was to recover a projector bulb so they could show movies again at The Kingdom and in particular at their upcoming fair. As you’d expect the cinema was packed with walkers but the survivors had a plan. 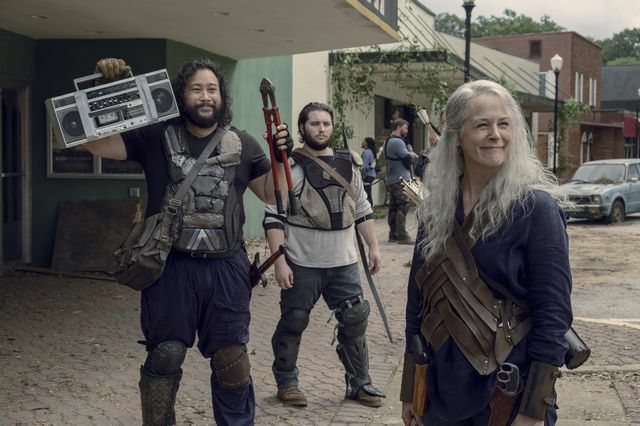 Jerry set up a boombox complete with mix tape to lure the walkers out. It worked well enough to get them all inside. The quest seemed to be going well when Jerry made it to the projection room and secured the bulb in bubblewrap. However a surprise walker led to him dropping it down into the main theatre. Ezekiel thought they should quit while they were ahead but Carol stepped up and suggested they finish their quest. After slaughtering the remaining walkers the group made off with the bulb and Ezekiel mused that maybe they were done losing for a while. Back to Hilltop, Alpha demanded her daughter be returned to her. Daryl (Norman Reedus) wasn’t keen on the idea, knowing the abuse she’d already suffered at the hands of her mother. Alpha raised an arm and a whole load more Whisperers arrived. Alpha promised no conflict as long as Lydia was returned. She then revealed that she held Alden (Callan McAuliffe) and Luke (Dan Fogler) who were both alive. She had wanted to kill them but wanted Lydia back more. She was prepared to trade the pair for Lydia. With seemingly no choice, Daryl went to get Lydia from the jail but found that she was gone. Obviously Henry (Matt Lintz) had let her out and they were nowhere to be found. Everyone began a frantic search for them but it was Daryl who worked out where they went thanks to the help of Dog. He wanted to go after them but Enid (Katelyn Nacon) thought she’d have a better chance of getting him back. Another girl went with her as she knew where Henry would have gone. Henry had snuck Enid outside the walls to a place where she could change her clothes. Enid and the other girl arrived and Henry confronted them. Enid made an appeal to Henry and told him about the trade for Luke and her boyfriend Alden. It seemed like Henry might not budge, but Lydia came out and decided she would go back to her mother to avoid the conflict. She kissed Henry goodbye before Daryl took her out the front gates to her mother. The trade was quick and went by without issue. Lydia apologised to her mother but was swiftly slapped across the face for not calling her by her preferred name of Alpha. Elsewhere in the episode, while everyone was searching for Henry and Lydia. It was revealed that one of the female Whisperers had a baby with her. She couldn’t keep it quiet so Alpha made her put it on the ground for some approaching walkers to deal with. Hilltop were horrified at what they were seeing. Luke and Alden tried to appeal for the baby to be saved but Alpha wasn’t bothered. 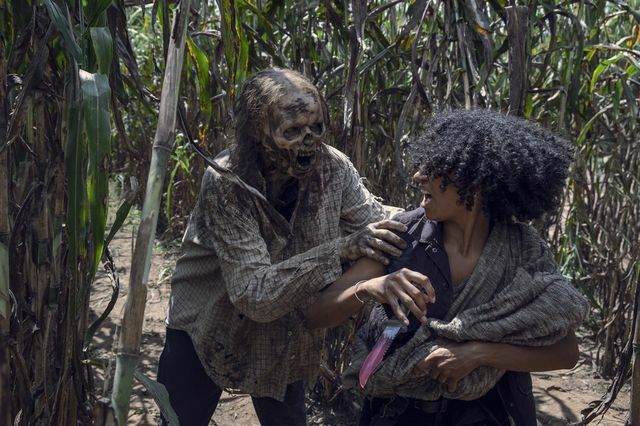 Luke spotted Connie (Lauren Ridloff) hiding in the corn and signed to her about the baby. Connie took a chance, revealed herself, fired her catapult at a walker and grabbed the baby before returning to the corn. As she tried to flee she was surrounded by walkers and had to fight them off. The Whisperers began to pursue her but she was saved by Daryl and Kelly (Angel Theory). The baby was later seen with Tammy and Earl. At the end of the episode, a note was found that Henry left saying he couldn’t live with Lydia going back to her mother. He’d gone off after her. Daryl got ready to head out with Dog. Connie saw Daryl leaving and decided that she needed to go along to help. Can’t wait for the next episode? Check out our preview of The Walking Dead – 9×12 Guardians.